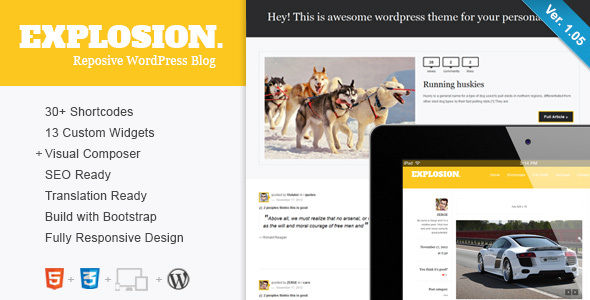 Explosion is a Responsive Wordpress Theme, best suited for Magazines and Blogs. It comes with 13 awesome widgets, 10 post formats, awesome Page Builder and tons of theme options. Explosion developed on the Bootstrap — beautifull boilerplate for responsive development so it look beautiful at any size, be it a 17” laptop screen or an iPad, iPhone. Visit Explosion Theme on your Small Devices. iPad and iPhone TESTED! This theme is Internationalized (translation ready) – the theme has been updated to support translations in more than one language. You can manage and edit all gettext translation files (.po/.mo) directly out of WordPress Admin Center without any need of an external editor. Responsive Design – This means you website will automatically adjust its layout and proportions to suit the device it is being viewed on. The theme content will be easy to read and easy to navigate whether it is being viewed on a desktop computer, a tablet or a mobile device. SEO (Search Engine Optimization) The theme is built with SEO best practices in mind. It uses semantical valid HTML code and CSS so search engines can index the content of your site with ease. Important content is always placed before unimportent in your source code (eg: Blog Post content before Sidebar), Page titles are wrapped in heading tags (h1, h2, h3 etc) to signalise their importance to search engines. The site also uses heavy internal site linking, which is also of vital for search engines (related posts, primary and secondary navigation menus, footer navigation, etc) With this Wordpress Template you are well equipped to get a high google ranking and attract visitors to show them your fantastic work. Coded with schema.org format Microdata can help search engines and other applications better understand your content and display it in a useful, relevant way. Our sites will be better seo-wise and easier readable by search engines. 1) Drawing a user’s attention to your relevant result. 2) Providing instant information as related to their query. 3) Increasing click-through rates and lessen the amount of bounces due to not searchers not finding the content they were looking for. AJAX Thumbnail Rebuild allows you to rebuild all thumbnails on your site. You can also select the thumbnail sizes you want to rebuild, so that you don’t need to recreate all images if you’ve just changed one thumbnail-size. You can also choose to only rebuild post thumbnails (featured images).